I’m having my English 10 students write in first person–narrative, autobiographical papers and journals. This can often be a challenge because they are asked to write about conversational topics in a conversational way, while still writing academically and with correct grammar, sentence fluency, etc. I take time to comment and give feedback to my students on their writing. I do this both handwritten and online, and sometimes I see the funniest things! 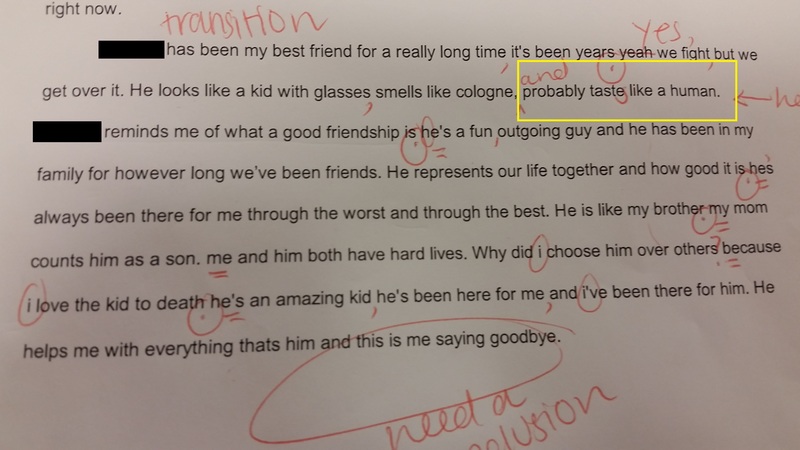 Apparently his friend ‘probably tastes like a human’. Too funny. Enjoy your Monday!